Grandmaster Repetoire DVD Series Play The Sicilian Part 2 (Najdorf) by Walter Browne GM Walter Browne. 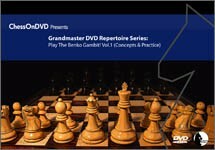 In the second volume of a two-volume dvd series, Six-Time US Champion GM Walter Browne, with the assistance of GM Ron Henley, discusses and analyzes a dynamic opening repertoire for Black based on the Sicilian Najdorf - a counterattacking response to 1.e4 favored by Bobby Fischer, Garry Kasparov and Walter Browne. On this dvd (and the companion dvd "Anti-Sicilian Systems"), Mr. Six-Time is your guide to navigating the Black side of the Sicilian - what Walter Browne doesn’t know about the Najdorf, you don’t need to know!